Planning a menu for your next Cinco de Mayo party? 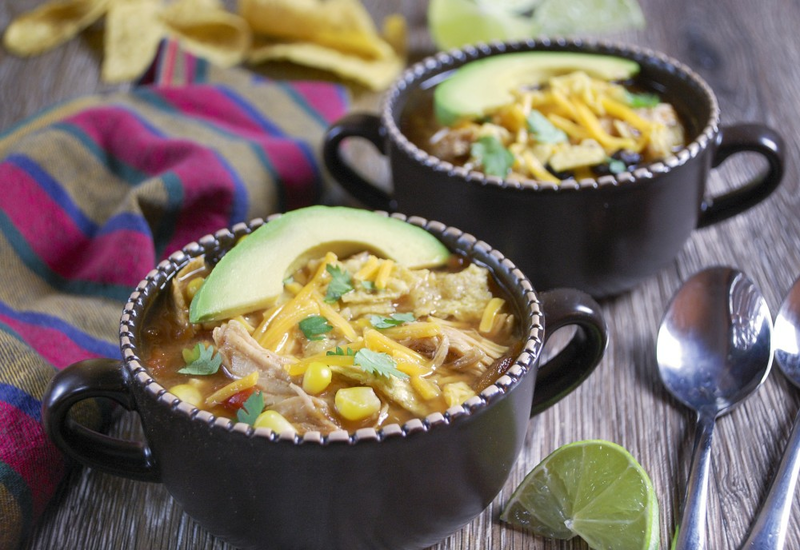 How about serving Chicken Tortilla Soup! When entertaining, you don't want to be stuck in the kitchen, so that's when you put the pressure cooker to work. Let your MultiPot make quick work of developing the flavor in this soup recipe featuring canned tomatoes and chiles, while getting the chicken nice and tender. Finishing this soup with crushed tortilla chips adds great flavor and texture. Add shredded Cheddar cheese and chopped fresh cilantro for extra flavor and color. Arrange chicken in pressure cooker; add chicken stock, tomatoes, chilies, tomato paste, garlic, chili powder, cumin, and oregano. Set pressure cooker to Sauté; add black beans and corn. Shred chicken using 2 forks and return to pressure cooker; stir. Simmer soup on Keep Warm until heated through, about 5 minutes. This soup is perfect vehicle for toppings; sour cream, a squeeze of lime, chopped tomatoes, and green onions are all great additions. Feel free to add any and all of your favorites! Diced green chilies come in both mild and hot varieties. That allows you to decide how much heat you want to put in this recipe. Per Serving: 388 calories; 8g fat; 32.0g carbohydrates; 47g protein; 104mg cholesterol; 743mg sodium. I made this chicken tortilla soup and it was so warming and delicious. It reminded me a lot of restaurant-style tortilla soup. The chili powder, cumin, and oregano gave this dish delicious, authentic flavors. Seriously, making shredded chicken in the pressure cooker is so simple, and this soup is just one of the amazing creations that can be prepared in around 30 minutes! Definitely my favorite chicken tortilla soup. I add extra cheese, avocado, and tortilla chips on mine. The stock is so flavorful, with all the seasonings and chilies. Perfect for cold weather days! Loved this for being such a super-easy and tasty recipe! Treated it like pho and let the kids assemble their own bowls, which was a winner. If I make the exact same thing and put it in front of them, it'd be "Ugh, DAAAAADDD!!!!" They didn't take any avocado, so more for me! Also added a bit of hot sauce to mine. Hot green chilies are the way to go in this recipe. Lots of heat, lots of flavor. I also topped it with the basics: sour cream, cheese, tortilla chips. Such a good recipe I’ll definitely make this again. I made this soup because I already had all of the ingredients and it seemed easy. Now, I will be including this recipe in my regular rotation. It is so delicious and I keep on craving it! I definitely would recommend this recipe. All I can say about this recipe is flavor town! Super easy and so delicious. I will definitely make this again. This soup is so, so good. It makes so much that we ate it for lunch the next day and another dinner. Really rivals the Tortilla Sup a local restaurant serves. First time using my new pressure cooker and tried this recipe. It was easy to make and came out perfect! So delicious! !